Whether it is for a Halloween celebration or a costume theme party, the right costume can make a big difference. Buying or renting a costume can become expensive and time consuming. If you find yourself in need of a creative costume, an entertaining one you can make yourself is the "bunch of grapes." It does not require a great deal of materials or time yet you can be the hit of the party for your originality and creativity. 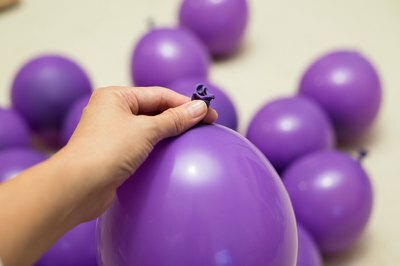 Blow up a quantity of purple balloons, making them various sizes. When you tie them off be sure to leave at least an inch at the ends. Keep them in 30-gallon trash bags. 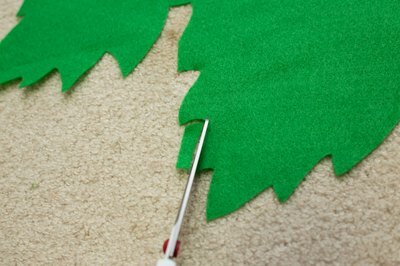 Cut a piece of green felt to make a circle that will fit around your neck, then cut the edges to make them jagged like a leaf. Fold the circle in half, then in half again. Snip off the inside corner to form a hole in the center, making one straight cut from the outer edge to the inner edge. This will be the opening that allows you to wrap the felt around your neck for the top of the grape bunch. Once this is completed, set the felt aside. Get dressed in your tights and long-sleeved shirt. At this time you will need assistance in finishing your costume. Once you have the undergarments on, take safety pins and very carefully begin pinning the balloons to your shirt, putting the pins through the ends. 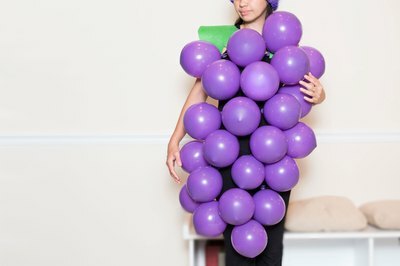 Place fewer balloons on the bottom of your costume near your hips, and more balloons at the top, shaping the bunch like a genuine grape bunch. Once the balloons are pinned on in the front and the back, slide the green felt collar over your neck. Place the cap on your head and you are suddenly transformed into a grape bunch. Now go and have a great time.